Goodbye Kiev, The Ukraine. Hello Kyiv, Ukraine. “Ukraine vs. The Ukraine,” by Eugene Volokh, The Volokh Conspiracy, 30 November 2006, http://www.tdaxp.com/archive/2006/10/28/ukraine-belongs-in-europe.html. There continues to be confusion over whether to use the article â€œtheâ€ in connection with â€œUkraine.â€ In the briefs, Gutnikâ€™s counsel uses â€œthe Ukraine,â€ while the government uses â€œUkraine.â€ Likewise, at joint remarks in January 2005, Vice President Cheney used â€œthe Ukraine,â€ while President Yushchenko, the elected leader of the country, used â€œUkraine.â€ See Press Release, Office of the Vice President, Vice Presidentâ€™s Remarks with Ukrainian President Yushchenko (Jan. 26, 2005) (Villa Decius, Krakow, Poland). We will use Ukraine, which is not only correct but is also preferred by Ukrainians themselves, see Associated Press, Terminology of Nationalism, N.Y. Times, Dec. 3, 1991, at A10, and is the grammatically consistent choice, see Andrew Gregorovich, Ukraine or â€œThe Ukraineâ€?, FORUM Ukrainian Review No. 90, Spring/Summer 1994. I say “The Ukraine,” because that’s how I learned it; I take it Cheney learned it this way, too. Interestingly, though Russian doesn’t have articles such as “the,” there’s a similar controversy there â€” for most areas, you’d say something is in the area (“v Pol’she, v Angl’ii,” “v” meaning “in”), but for the Ukraine, you’d say something is on it (“na Ukrain’e,” “na” meaning “on”), or at least that’s how you said it when I was growing up during the Soviet era. Nor was it just a country vs. area-in-a-country distinction; you’d say “v Litv’e,” or “v B’elorussii,” but “na Ukrain’e”). Catholicgauze, meanwhile, is standing against the tide of linguistic history. 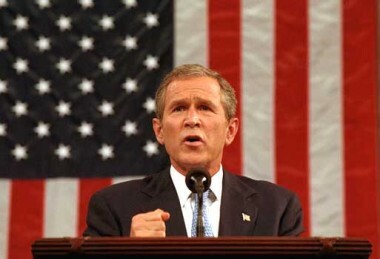 Bush: A Terrorist-Appeaser Mugged by Reality? “U.S. Considering Ending Outreach to Insurgents,” by Robin Wright, Washington Post, 1 December 2006, http://www.washingtonpost.com/wp-dyn/content/article/2006/11/30/AR2006113001710.html (from Daily Kos). “The 80% Solution,” by BarbinMD, Daily Kos, 1 December 2006, http://www.dailykos.com/storyonly/2006/12/1/73529/5740. Is This Man Coming Back? If this is true, thank God. For three years Bush has led us into the wilderness, appeasing terrorists, subverting a democratically elected government, and exposing his administration for the out-of-date, intellectually bankrupt organization that it really is. The sooner Bush accepts the reality that the United States Military gave him on a silver platter three years ago, the better for us, for the Iraqis, and the world. Bush’s greatest accomplishment, if he actually begins fighting terrorists and supporting democracy in Iraq (instead of vice versa), is smashing our enemies, to forever weaken the Arab National-Secularists and the Qaeda Jihadis. Iraq is Vietnam for al Qaeda and al Baath. Note: this is a comment left at TDAXP â€” rather, an attempted comment, since once again I am apparently barred from leaving this comment on Blogspirit. This time, an old Blogspirit Phenotype is being expressed: I hit SEND to post the comment, and Iâ€™m instantly redirected to the front page of TDAXP, without the comment being posted. This has happened more than once with this comment, so Iâ€™ve given up. Iâ€™m tempted to create a new category for Phatic Communion, TDAXP Comments, and utilize the trackback feature for connecting these to individual posts on that blog, since Iâ€™m apparently able to leave trackbacks to TDAXP. Such a method would be queer indeed, because Iâ€™d be establishing a new kind of social interaction, I think â€” unless some other blogger already dedicates a portion of his own blog to posting comments intended for another specific blog. The format might need tweaking. The problem for me is that â€˜commentingâ€™ is a slightly different intellectual format than posting ripostes or highlights as a new post. More specifically: Danâ€™s Blogspirit setup does not allow HTML formatting â€” which has always been an irritation for me â€” and this limits speech. Odd little notations must be created when commenting at TDAXP, e.g. using asterisks to express emphasis and posting full links as footnotes or interjections rather than linking text. So the following comment to â€œGrowing Pack Behavior in Juvenile Homo Sapiensâ€ will be revised here on Phatic Communion to HTML-formatting and thus in that particular only will not match the comment I intended to leave but may therefore be more legible. I agree with everything that Curtis is saying. This is sickening. Blogspirit suffers prologued, partial, outages of service and doesn’t bother to inform bloggers that this will happen, is happening, or has happened. Horrid service like this is why I admire Dreamhost, the service that hosts Jim River Report. They have technical snafus too — everyone does. But unlike blogspirit, Dreamhost has the basic human dignity to let its customers know what is going on.